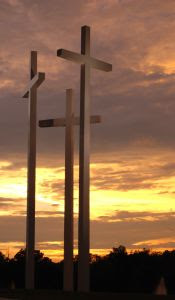 Tomorrow will be Good Friday, a day when we commemorate Jesus sacrifice on the cross for us. Each year I like to think on this in a most serious manner… after all: could you or I endure such pain and ridicule for a people who could be so cold and calloused towards God? This criminal, hanging next to the savior of the world, was so completely and truly repentant: knowing he deserved his crucifixion… and he desired forgiveness from the One who deserved glory. He defended Jesus and he asked… knowing he deserved NOTHING. I found myself reflecting: how often do I truly humble myself to a deserving fate in submission to those who have not wronged and deserve better? How often do I deny asking for forgiveness from God or man because of foolish pride? I feel challenged by this humble criminal hanging on a cross beside my Savior. This Easter season I desire to deeply examine myself, embrace all humility and search for opportunities to honor those whom God is truly reflecting His glory through. To not be afraid to repent of and speak about my flaws, knowing I am lifted up and set free when I submit to humbly bowing down. And we indeed have been condemned justly, for we are getting what we deserve for our deeds, but this man has done nothing wrong. When the centurion saw what had taken place, he praised God and said, "Certainly this man was innocent." though a member of the council, had not agreed to their plan and action…and he was waiting expectantly for the kingdom of God. …just something to think about as we prepare for Easter. Be wonderfully blessed by His sacrifice and presence this Easter! "I am lifted up and set free when I submit to humbly bowing down"...yes, so true. I am joining you in the pursuit of humility, thank you for your words! I am blessed to know I have good company on this path I travel. May God be glorified! This was a beautifully written and very thought provoking post and how BLESSED we are to have such a wonderful Heavenly Father, an amazing Savior and Holy Spirit with us. Hallelujah to the King of Kings! God's Word stands True and straight to our hearts. I am blessed you could enjoy His word here today. Thank you for reminding me to put (and keep) my focus where it belongs---during Holy Week and every day!